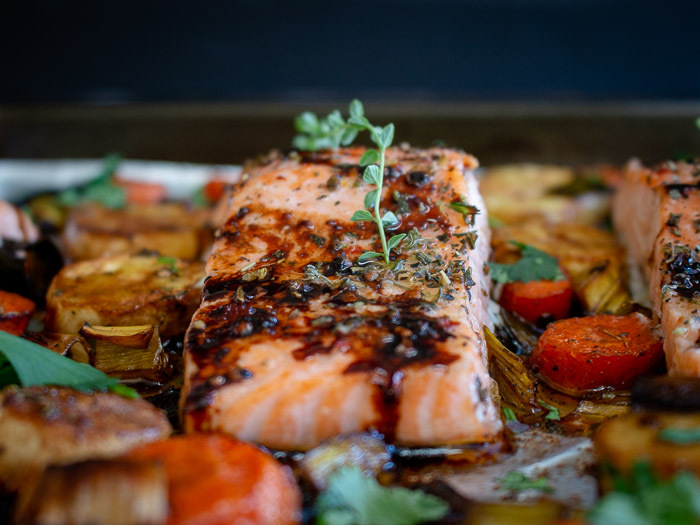 Sheet Pan Balsamic Glazed Salmon and Roasted Root Vegetables is a super easy less than 30-minute meal that is going to be your new go to weeknight meal that is fancy enough for guests. Flaky succulent salmon drizzled with a delicious aged balsamic glaze and roasted caramelized parsnips, carrots and leeks are roasted on one simple sheet pan. 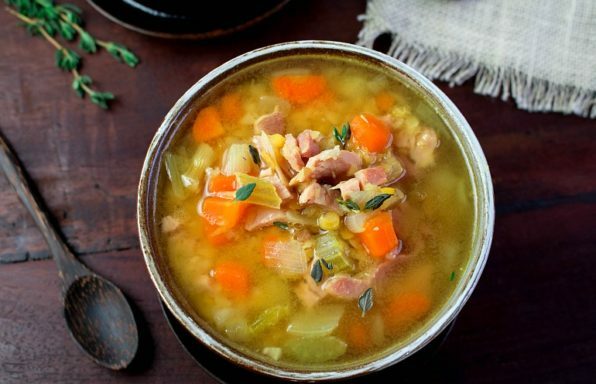 Now, this is some serious comfort food without breaking a sweat. Salmon is a fish that can stand up to strong flavors. When you sauté a little fresh garlic, EVOO and salt and pepper and then add in a little Mie Radici balsamico you get this thick, rich, slightly sweet glaze that is mind blowing. Yep, we used the word "mind blowing" as it is sweet, savory, slightly tart and almost has a molasses flavor. 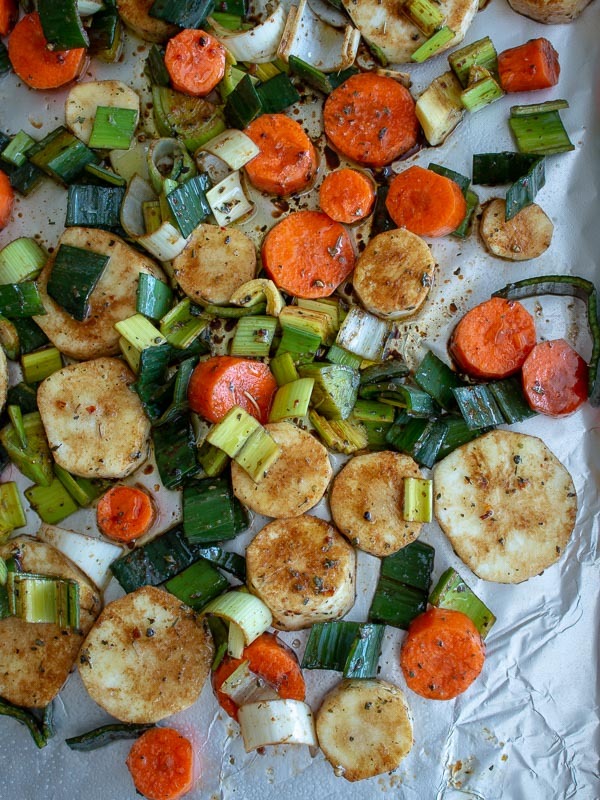 Parsnips, carrots and leeks tossed in a little delicious Extra Virgin Olive Oil, aged balsamic, Sicilian Spice Blend is all you need to take this recipe to the next level. Sheet Pan Balsamic Glazed Salmon and Roasted Root Vegetables because SHEET PAN DINNERS Rock! Sheet pan dinners are better than sliced bread. With only one pan to clean up and so many complex flavors, you are going to wonder why you are not doing more sheet pan dinners. 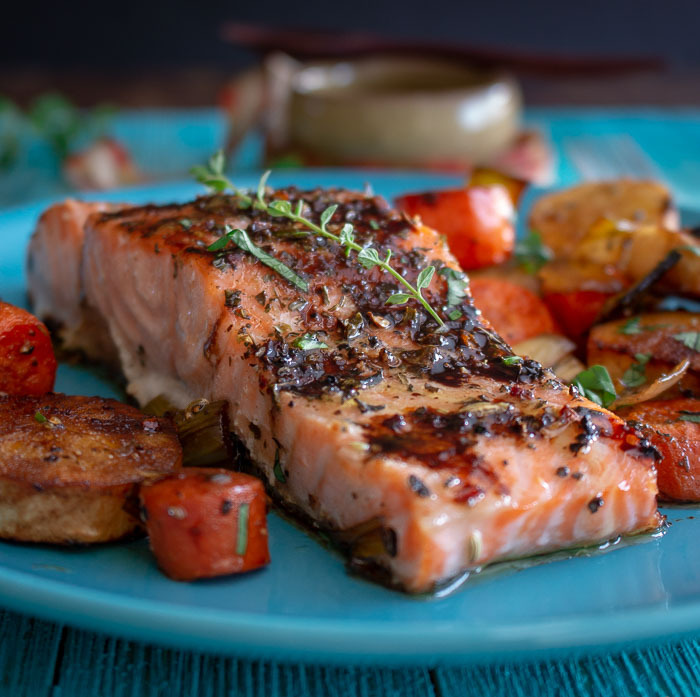 Have you tried our One Sheet Pan Dilly Lemon Salmon , Baked Spicy Salmon Sweet Potato Hash or our Spicy Citrus Baked Salmon Packets or our Baked Pomegranate Glazed Salmon? . My word do you see the trend here? We are seriously concerned we may have an addiction to SALMON. What vegetables are best to serve with Sheet Pan Balsamic Glazed Salmon and Roasted Root Vegetables? Any vegetable that you have in your crisper that is firm root vegetable or has similar cook times are perfectly fine in this recipe. We used carrots, parsnips and leeks as that is what we had in the crisper. However cauliflower, sweet potatoes, Brussel sprouts (if you are into that type of thing), beets, yams, rutabagas, turnips, daikon, onions, etc,. would all work well in this recipe. 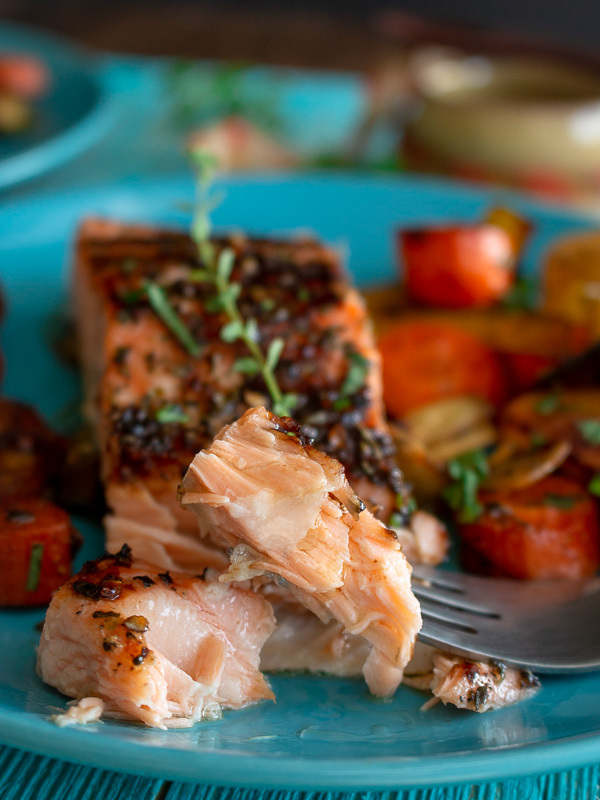 As the salmon only takes a few minutes to cook, we put in our balsamic glazed root vegetables to cook for 10 minutes first to get a head start on the process. 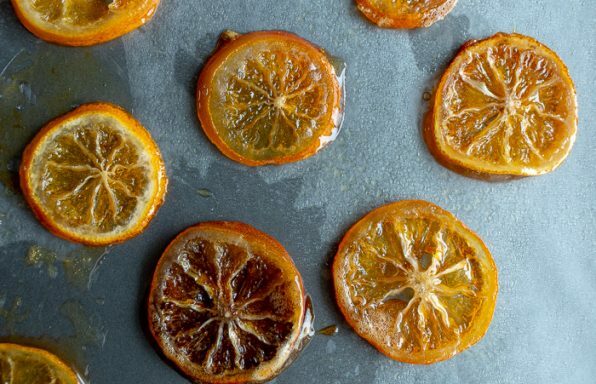 You may be asking are all balsamic vinegars the same and the answer is absolutely not. There are 3 grades of balsamic vinegars from Italy and each have their appropriate uses and one we will just call industrial grade, for a lack of a better term, to make this an even 4 types. Traditional Balsamic Vinegar of Modena and Reggio Emilia Under the Special DOP Certification This is the king of balsamic vinegars. Pure and made from a cooked grape musk and then aged for a minimum of 12 years and comes with a steep price tag. During this time, the vinegar gets thick, rich and extra delicious. Some are aged even longer. The traditional balsamic vinegar gets thicker as it evaporates and ages in a succession of wood barrels. The quality of the balsamic is dependent on the quality of the grapes, types of barrels and the climate. Fabulous drizzled over strawberries or over your favorite gelato. Balsamic Vinegar of Modena under IGP Certification. We used Fondo Montebello Aceto Balsamico di Modena I.G.P. 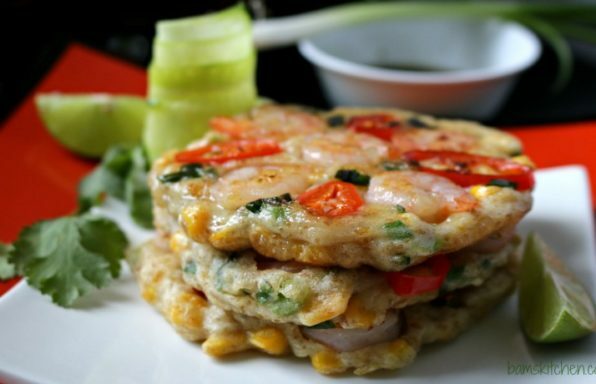 (Protected Geographical Indication) for this recipe. We love this product from Mie Radici. This balsamic was aged for 10 years. It does not contain any additional coloring or additives. Medium thick pour and a deep delicious flavor from the aging in wooden barrels. This type of balsamic vinegar will not break the bank and it is absolutely delicious on grilled and roasted meats and vegetables. Balsamic Condiment produced in Modena. It is a younger vinegar and usually contains a small percentage of wine vinegar to give it more acidity and it is a bit thinner in texture. Industrial Grade Balsamic…(Fake balsamic vinegar) You know the items in the store that are mostly all red wine vinegar with just a dash of food coloring in it and brown sugar. These were not made from the grape musks but mostly just red wine vinegar and a little thickening agent or colorants. It may be very liquid in nature and has a very strong acidic smell. If you use a good balsamic vinegar then there is no need to cook the glaze down. We made our glaze by frying a little garlic in EVOO and then taking the sauce pan off the heat and adding our Fondo Montebello Aceto Balsamico di Modena IGP at the very end. This balsamico is already a medium thickness so we just drizzled it onto the salmon the last 2 minutes of the cooking process. If you use an industrial grade balsamic from your local grocery store for $3.99 you are going to have to do a wee bit more work to make this into a delicious glaze. It will take you approximately 15 to 30 minutes over medium low heat to allow the balsamic vinegar to reduce by half or until it coats the back of a spoon. Please note that the reduced balsamic glaze will continue to thicken as it sits. If you over shoot and get it too thick, add a couple drops of the original balsamic to thin out. The glaze will naturally get sweet as it reduces so there is no need to add sweetener to it. Do not add the glaze over the salmon at the beginning of the cooking process as it will smoke and lose its flavor. Only add the glaze at the very end of the cooking process. About 1-2 minutes left. Cooking time for your salmon will be dependent on how thick your fillets are. Start checking your salmon at the 7-8 minute mark. Your salmon may take between 10- 15 minutes until they flake easily with a fork. As you may know not all salmon are the same. 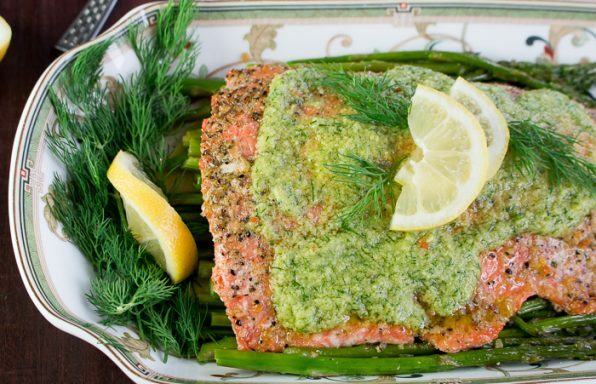 You will want to avoid all farmed raised salmon and go for the wild salmon instead. Farm raised salmon may have a high amount of PCB and should be avoided. Wild salmon has less toxins and is high in omega 3 Fatty acids which is important for reduction of inflammation and blood pressure. Did you know that balsamic vinegar is good for a healthy gut? As we have discussed, “REAL” balsamic vinegar is a naturally aged product and one of its compounds, acetic acid, contains strains of probiotic bacteria. These probiotics help enable healthy digestion and improve gut health. We are here in January get back into a routine month. After a month of abusing your body with sweets, treats and alcohol over the holidays, it is time to get back to clean eating. 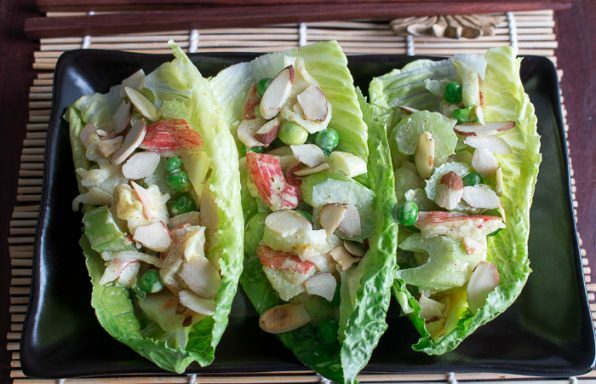 Simple clean foods with just a handful of ingredients that we can pronounce. This might sound easy until you start looking at ingredients in the items you buy at the store. We spend most of our time on the external walls of vegetables, fruits, and lean proteins. We also believe in easy to digest comfort foods that are healthy for digestion. 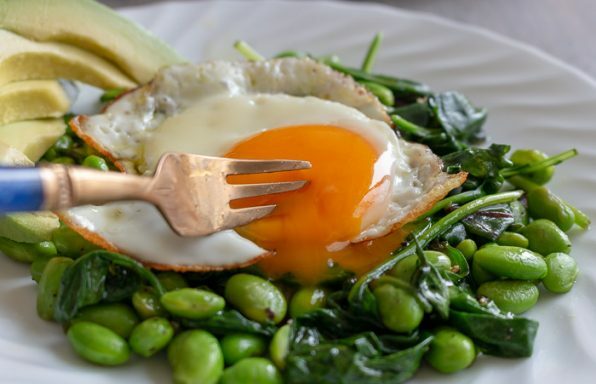 Please take a look at our Feed your Spleen: Nourish Your Body Post to refresh your memory on foods that are easier for your body to extract nutrients from. 2Line baking sheet with aluminum foil. Toss carrots, parsnips, leeks, 1 teaspoon of Italian seasoning, 2 tablespoons of olive oil, salt and pepper to taste directly on to your lined baking sheet. Spread out to a single layer of vegetables. Bake for 10 minutes. 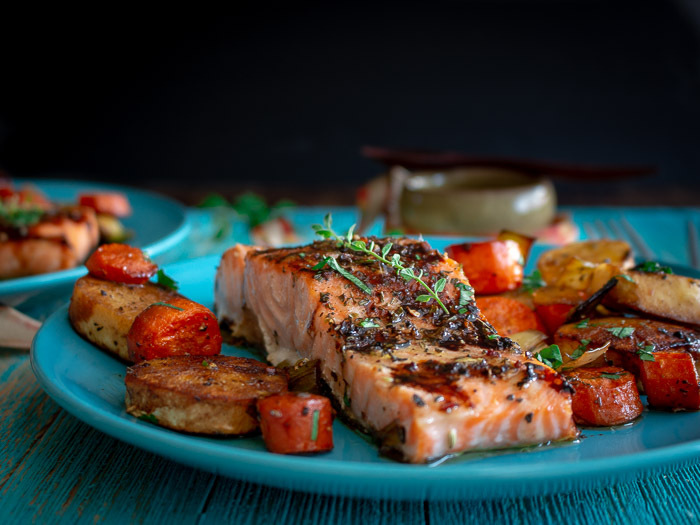 3In the meantime, rub each of your salmon fillets in olive oil, salt and pepper and the remaining 1 teaspoon of Sicilian Spice Seasoning (or Italian spice blend) Remove your roasted vegetables out of the oven and make 4 spaces between the vegetable for your salmon fillets. 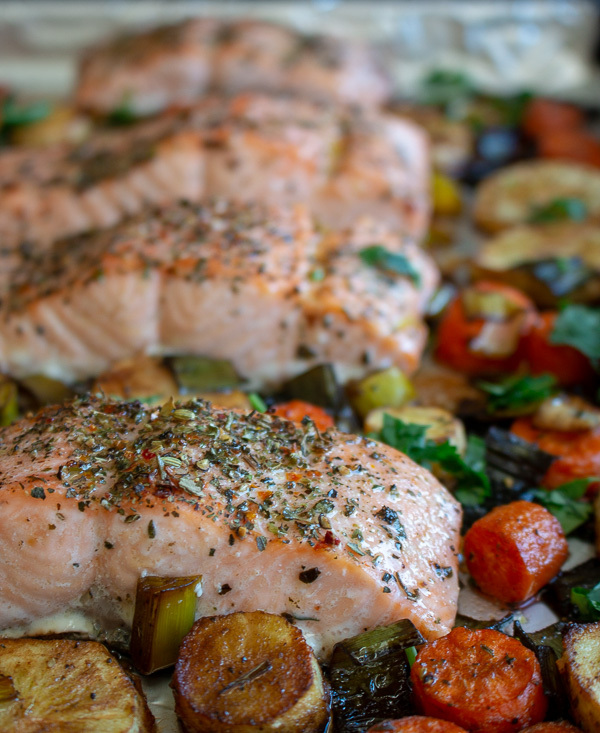 Place your salmon fillets on to the pan with the semi-roasted toot vegetables and place back in the oven for 7 minutes. 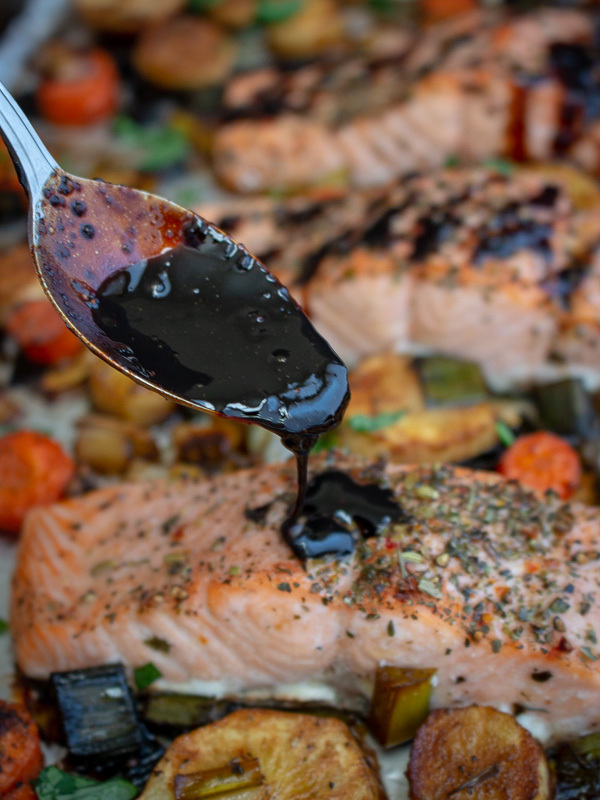 4While your salmon is baking, make your balsamic glaze for the top of the salmon. 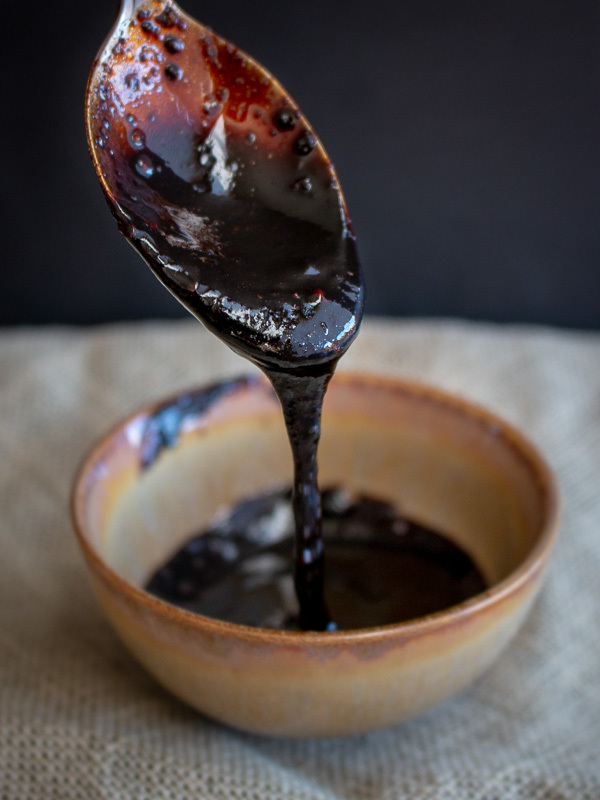 6If using the regular run of the mill grocery store industrial grade balsamic, you will need reduce 2/3 cup of balsamic vinegar in a pan for about 15 minutes until it starts to coat the back of the spoon and then add a tablespoon of EVOO and garlic to the pan. Set aside. 7Assess your salmon to see if starting to flake with a fork. Your salmon fillets will take between 10 to 15 minutes to cook depending on thick your salmon fillets are. 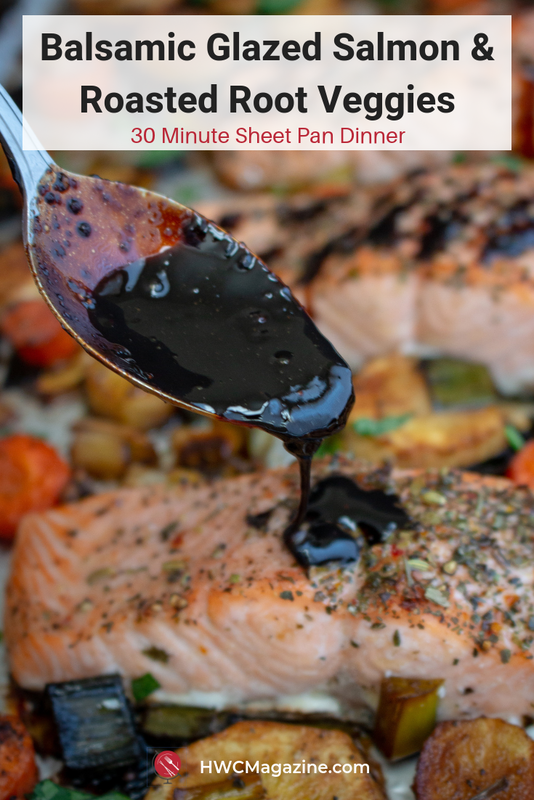 About 2 minutes before you are ready to pull your salmon fillets out of the oven drizzle the balsamic glaze over the salmon and return back to the oven. 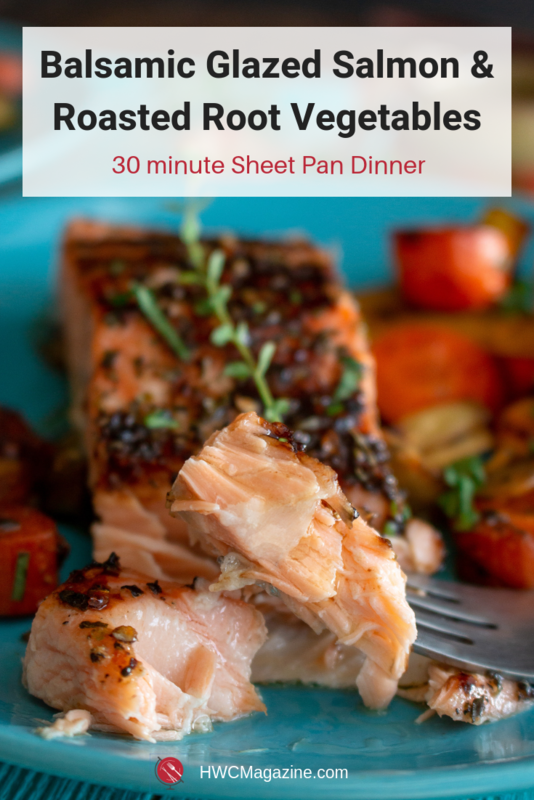 8Once your salmon flakes easily with a fork, remove your sheet pan from the oven. Garnish with fresh herbs if desired and Enjoy!